June 30, 2018 – …STILL CRAZY AFTER ALL THESE YEARS! I dropped by my regular Malay kuih stall at Bandong the other morning but there wasn’t a very wide variety of choices available. The boy said that many had not got back into the swing of things and were not delivering their stuff for sale yet. Gosh!!! It had been over two weeks since the Raya and yes, I did notice around town that some of the Malay/Muslim shops were still closed. That is a stark contrast from how some here will open their shops even on the 1st day of Chinese New Year, double or even triple their usual prices, grabbing the opportunities as they come along. 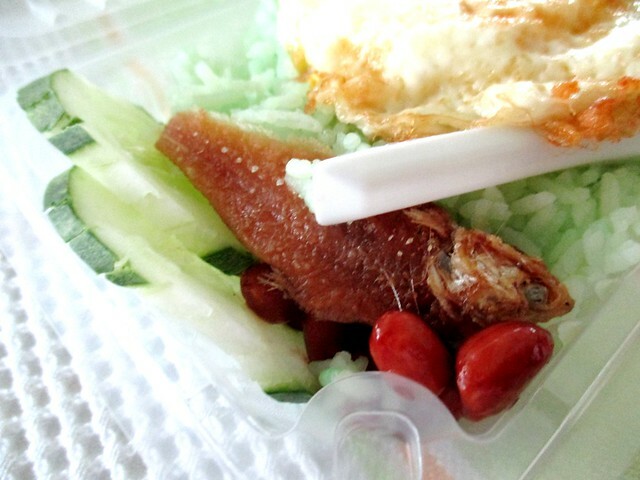 …in place of the regular fried ikan bilis (dried anchovies) and together with the (albeit overcooked) egg, it was all right, just that you would not catch me buying that a second time. Meanwhile, the nasi lemak guy at his stall a stone’s throw away was back in business and enjoying brisk business with a lot of customers eating there or buying packs and packs to take away – it actually took a long time for my orders to be ready but it did not matter as old retirees like me have all the time in the world. While I was sitting there waiting, everytime he opened his insulated pot with the rice inside, I could catch the waft of the lemak-ness. 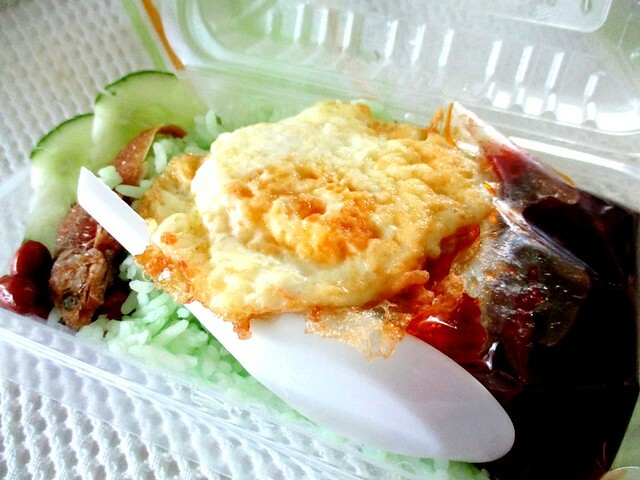 Now, THAT is what all nasi lemak worthy of the name should be like. I asked him why I did not see him during Ramadan and he said that he opened at around 4.30 p.m. till 6 something only. No wonder I missed him – I would make it a point to go earlier, at around 3 as later than that, the bazaar would be very crowded and one would probably have to park the car a long distance away. It certainly was my loss though as he said in that one month, he also had nasi biryani and nasi minyak – I sure would love to try those, if only I had known. 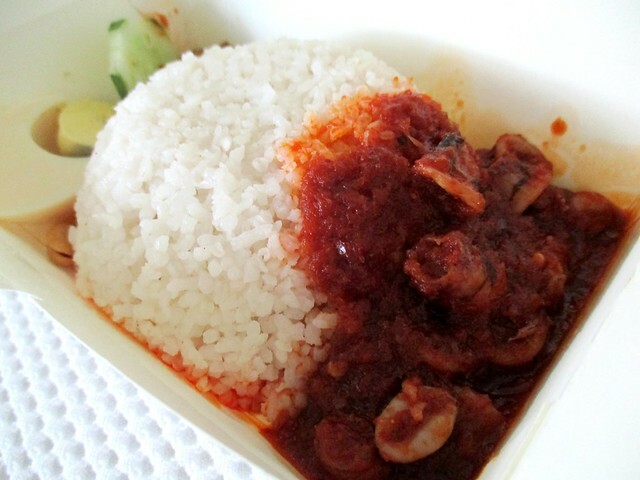 …as I did ask him about his kerang (cockles) and he said that he used the canned ones and yes, his nasi lemak was as good as ever, definitely my No. 1 in town. In the meantime, I also happened to drop by this coffee shop opposite the car workshop that I go to the other day. When I first went there in 2015, I did go and have a look at the chap fan (mixed rice) dishes at the zi-char (cook & fry) place at the back. Everything looked rather good, something like our own home-cooked dishes and I did hear from my friend, Annie, in KL that her mum, who lives close by, would sometimes buy from there – cheap and nice so all this while, I had been wanting to go back and give it a try but I never did. …instead. It tasted quite good though it did not have the coveted wok hei fragrance nor was it in any way, anything like our Foochow fried noodles. I asked the workshop boss and he told me that it was an Indonesian, working for the new owner, cooking in the kitchen and that the people who were there before had called it a day or had moved elsewhere. I guess I can strike this one off my list of must-go-and-try places now. Well, lesson learnt! If there is anything that I want, jump at it – jangan tunggu lama-lama (don’t wait too long)! 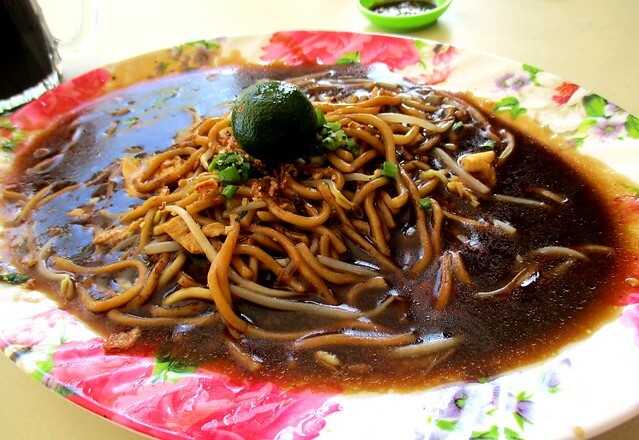 Mak Met’s Breakfast Station (2.314192, 111.825581) is located at the shops along Jalan Bandong in Kpg Nangka here, facing Bandong Walk. 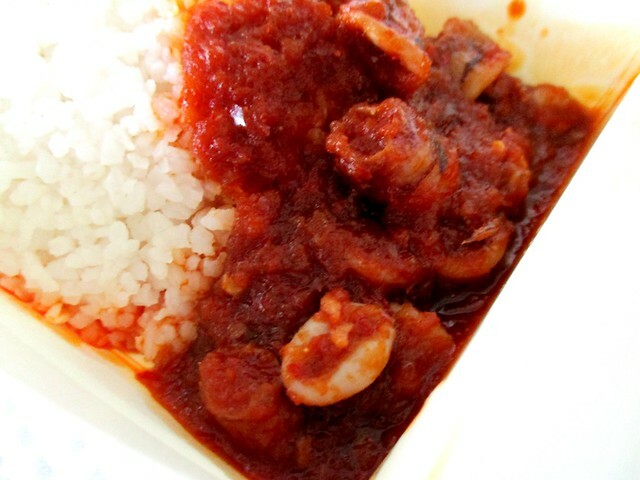 and THE NASI LEMAK STALL (2.313869, 111.825808) is located at Bandong Walk, Jalan Bandong somewhere in front of the block of shops where the 1Malaysia clinic is and UNCLE LAU CORNER (2.328131, 111.840397) is located back to back with Udak Kitchen which is to the left of Everwin, Sg Merah along Lorong Sungai Merah 2C, off Jalan Teng Chin Hua.